I am currently smack dab in the middle of my fall break. Our district is on a modified year round schedule that I love! We finished up 1st quarter at the end of September and then get two glorious weeks off. This past week we helped my sister move into her new house (congrats sis! ), I worked on some new resources (Calendar Math Semester 2 - on sale through tomorrow, and a new Lapbook/Interactive Notebook for the Age of Exploration! ), played with my kitties and ratties, saw some friends, and rested my knee (it's still on the mend). Next week we are off on a mini-vacay to Disneyland and California Adventure. We're taking my MIL and she is so excited I think she was packed at least a week ago! My to-do list is still longer than I will have time for but I desperately need to post some proper blog entries! Today I have a little tip for anchor charts, although I assume I'm not the only teacher that does this. This is my first year doing Reading Workshop and using anchor charts, but I wanted to make them more meaningful and useful to my students. Our first eight anchor charts we created together as a class, the students gave input, I wrote them out, and then I took photos of them and gave them a copy to keep in their notebooks to reference back to. I promise they are easier to read in reality than on this photo. But I managed to fit all eight on one page. But, I still felt that there was something missing. I wanted the students to have their own mini-anchor charts to fill out as we did as a class. 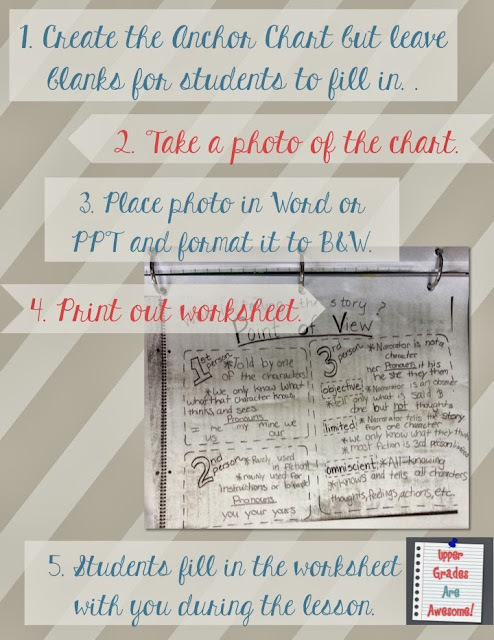 With a few easy steps I quickly turned our anchor charts into fillable worksheets. So, I decided to create most of the anchor chart and leave the "notes" part blank. I snapped a quick photo with my cell or point-and-shoot - nothing fancy- and then uploaded them to Word or PPT. Actually, I tried to use Picasa first, but I couldn't get a proper B&W contrast. Microsoft has a great photo filter that easily makes the photo B&W and printable. 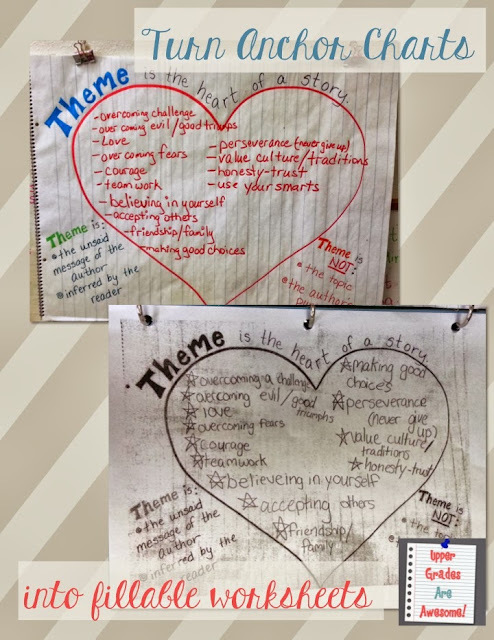 My before photo of the Theme Anchor Chart is sitting on my school computer, so just imagine that the inside of the heart was left blank. In the second photo you can see that my student wrote exactly what we wrote as a class inside the heart. This is hole punched and kept in their Reading Workshop Binders. My students were pretty impressed with this. 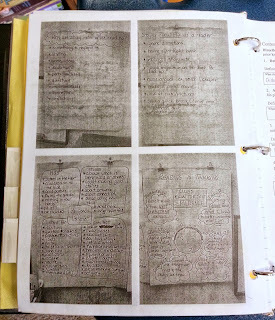 Many couldn't figure out how on earth their worksheet looked exactly like the anchor chart in front of them. Minds were blown! Most of the anchor charts I have been using I've borrowed/adapted from Pinterest. Thank you to all those teachers who share their anchor charts for newbies like me. You can follow my anchor chart board to see some of the ideas I've gathered. 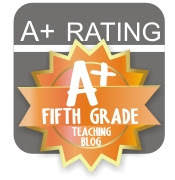 UPDATE: Here is the quick tutorial for making anchor charts into worksheets using PPT. This sounds amazing! It's now on my to-do list. I really like this idea! Thanks for sharing the tip with us. Great idea! Can you explain to me how you uploaded it to PPT? I prefer that to word. I would like to try this myself, but don't know how to make it black and white in PPT. A little tutorial would be amazing! Thanks for sharing such a great idea! Wow, That's a nice method...... If I want to remove background from image, is Photoshop is perfect?? or gimp? Calendar Math Semester 2 is finally here!